This month, French demonstrators wore “yellow vests” to block highways from Provence to Normandy. They rioted in Paris and left French President Emmanuel Macron struggling to meet their demands. Women’s groups across Latin America have said they will keep fighting for a right to abortion. 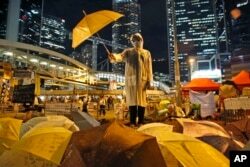 The yellow color was borrowed from another of Asia’s pro-democracy protests in the 1980s. At that time, Filipinos wore yellow in an effort to drive out the country’s dictator Ferdinand Marcos. 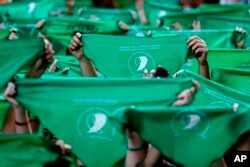 In Iran, supporters of reformer Mir-Hossein Mousavi wore green to support his campaign against then President Mahmoud Ahmadinejad and the country’s clergy in 2009. 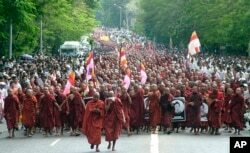 Buddhist clergy led protests against Myanmar’s military government in 2007. The dark brown color of their clothes gave the movement its name, the Saffron Revolution. On September 24, over 100,000 Buddhist monks marched in Rangoon as demonstrations took place throughout Myanmar, also known as Burma. The military’s violent response led to worldwide condemnation. Under international pressure, the military slowly approved a new constitution and held democratic elections. In 2015, Aung San Suu Kyi’s opposition party won the majority of seats in national elections to take control of the government. Yellow is the color connected with the late King Bhumibol Adulyadej of Thailand. 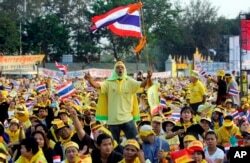 On the 60th anniversary of the king’s rule, opponents of former Prime Minister Thaksin Shinawatra wore yellow calling for his removal from office. In September 2006, Thailand’s military ousted Thaksin from office saying he had abused his power. 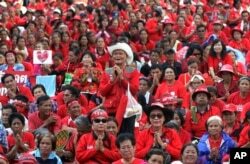 Thaksin’s supporters reacted by wearing red shirts. In Thailand, red is one of the colors of the national flag representing the nation. The other colors are white for religion and blue for the monarchy. FILE - Orange was the campaign color of Ukraine’s pro-Western presidential candidate Yushchenko in the 2004 presidential election. Orange was the campaign color of Ukraine’s pro-Western presidential candidate Viktor Yushchenko in 2004. Political disputes ended Yushchenko’s presidency in 2010 and led to the ongoing conflict between Ukraine and Russia. 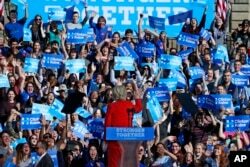 The words “blue states” and “red states” gained new attention during the disputed 2000 U.S. presidential election. 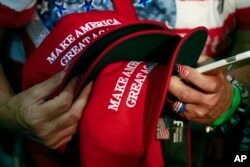 The color red came to represent Republicans and blue, Democrats. The division between “red states” and “blue states” has expanded to clothing. Politicians and supporters from the two parties often avoid wearing colors connected to their opponents. I’m Mario Ritter. I'm Caty Weaver.